Data capture specialist Kendata Peripherals has expanded its portfolio of Scantron products with the addition of the iNSIGHT 4 scanner, which offers a powerful combination of OMR (optical mark reading) technology and image capture capability. Kendata is Scantron’s longest-established UK distributor,and the iNSIGHT 4 is the first of a raft of new products resulting from the recent acquisition of NCS Pearson by Scantron’s parent company, M&F Worldwide Corp. The iNSIGHT 4 is one of the most versatile and efficient scanners available for automated data collection. As well as being able to read traditional OMR marks and check-mark boxes, the scanner includes intelligent character recognition (ICR) technology to enable it to convert hand-printed characters into digital data. This is a particularly useful facility for registration details such as names, addresses and identification numbers as it eliminates the time and cost of manually keying in the information. 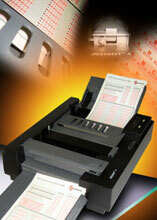 However, what really sets the iNSIGHT 4 apart is its ability to capture images of the scanned documents. With a single pass through the scanner, the iNSIGHT 4 can capture all the data on a form, together with an image of the whole page or just a user-defined field such as a comment box. This enables the user to create electronic archives which can then be easily shared online with colleagues. Designed for ease of use, the scanner incorporates a fixed automatic-feed input hopper with a 100-sheet capacity, which eliminates the need for continual form reloading and constant operator attention. An open feed path allows sheet visibility at all times, as well as easy access for sheet removal and transport cleaning. There is a 40-character alphanumeric display for operator messages, and scanner self-diagnostics quickly pinpoint any operational problems. Equipped with both USB 2.0 and RS232 interfaces, the iNSIGHT 4 is fast, accurate and efficient. It can accommodate form sizes from 63.5 x 127.0mm to 228.6 x 355.6mm and has a throughput rate of up to 2200 sheets per hour. The scanner is ideal for a wide variety of applications, including multiple-choice exams, course-evaluation surveys, registration forms and all types of questionnaires.